10 Stunning Bar Cabinets for a Stupendously Smashing Party! Tis the Season to be Jolly and what’s more important than your bar? 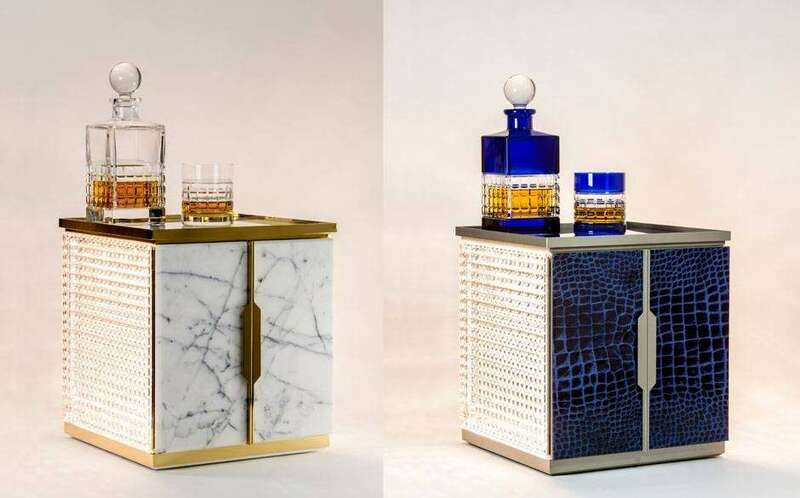 Here are 10 showstopping drinks cabinets, fixed or mobile, that are guaranteed to make any party the toast of the town! So let’s celebrate with style and let me know your favorites! 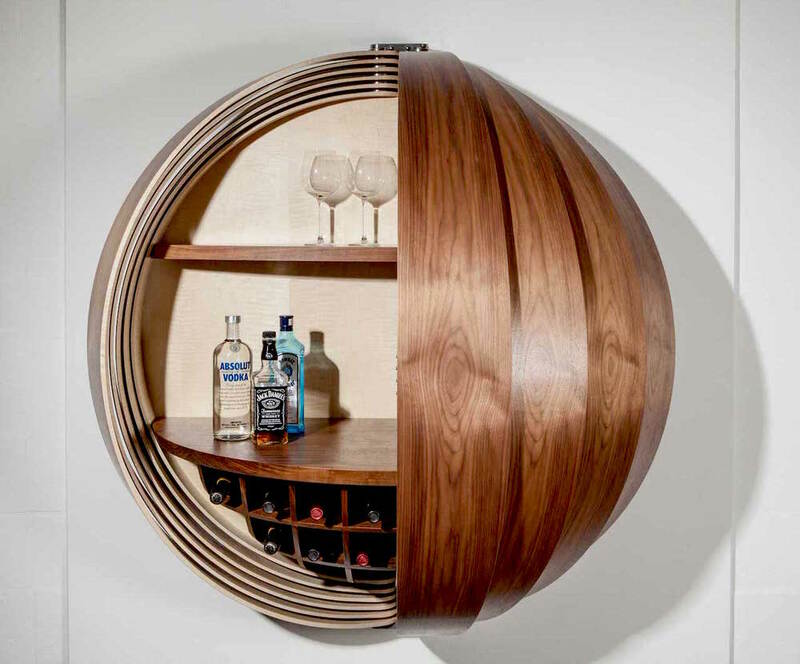 The rosewood Dime Cabinet is a semi-spherical wall mounted bar inspired by a spinning coin. Looking like a sliced onion, the partially opened cabinet reveals curved segments that stack neatly atop each other. 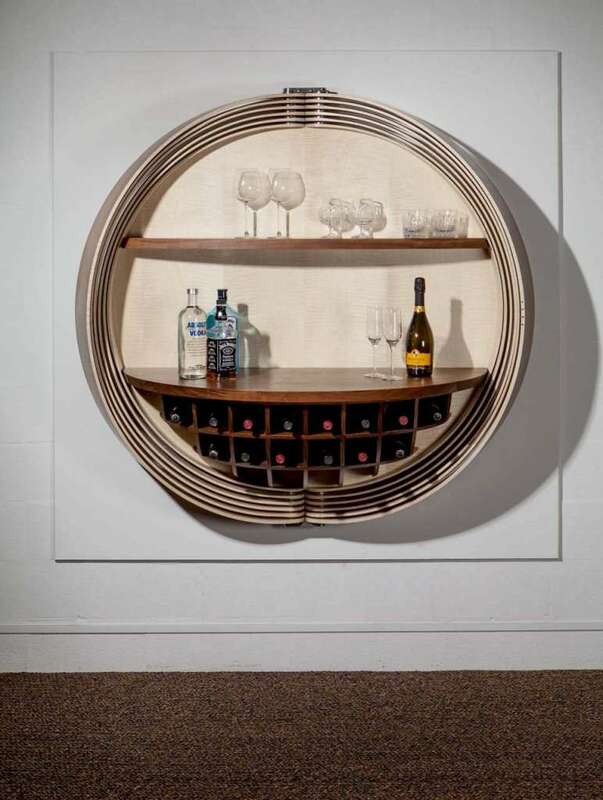 Created by Miles Hartwell and Matt Withington, the striking drinks cabinet doubles as a piece of wall art. The look is very dynamic and changes according to the positioning of the rosewood segments. Two bespoke desktop bars from Waterford. A drinks cabinet that celebrates Portuguese heritage. 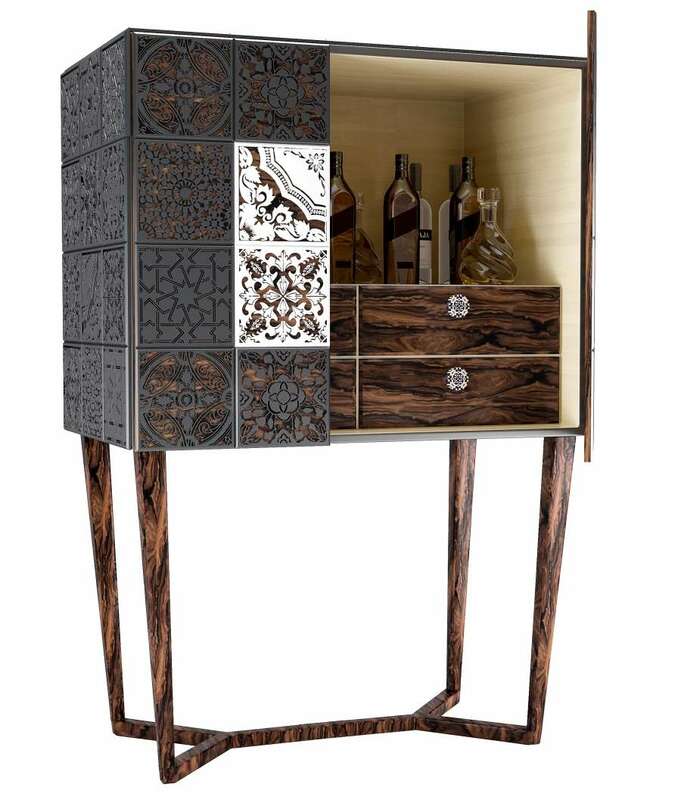 Created by Malabar, the iconic Portuguese tiles of the bar cabinet are carved out to reveal matte finished, polished ironwood underneath. The blond satinwood interior is an elegant foil for the highly figured ironwood drawers and legs. The masterful design and craftsmanship comes with a price, to the tune of $14,700! 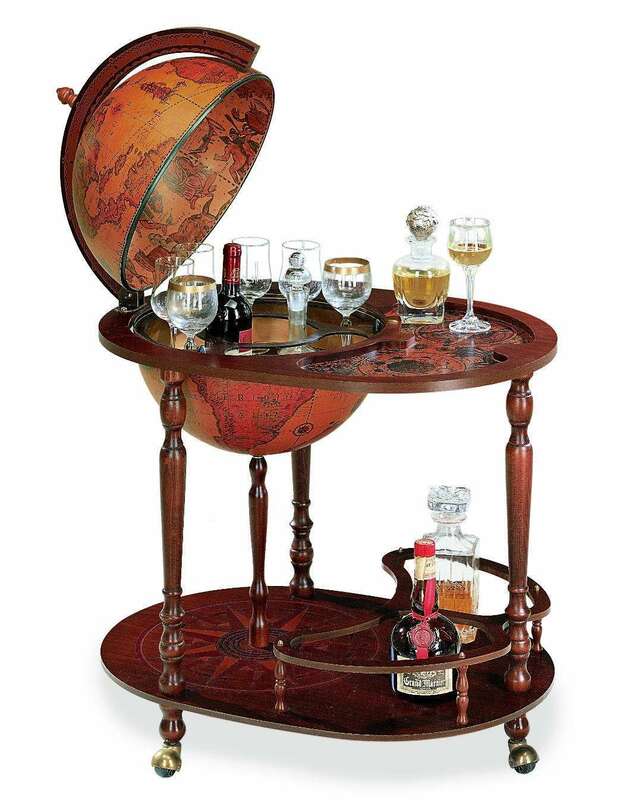 Here’s the perfect drinks trolley for globe-trotters. 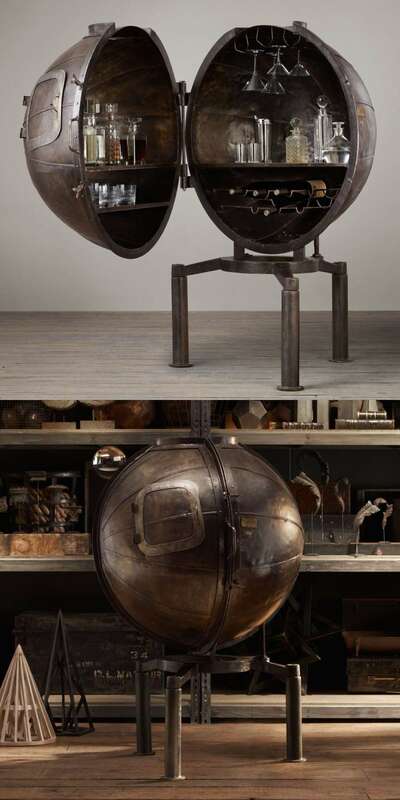 The 16th century hand-finished reproduction globe stores your liquor and barware in style. The globe even spins when open or closed to keep your guests entertained! 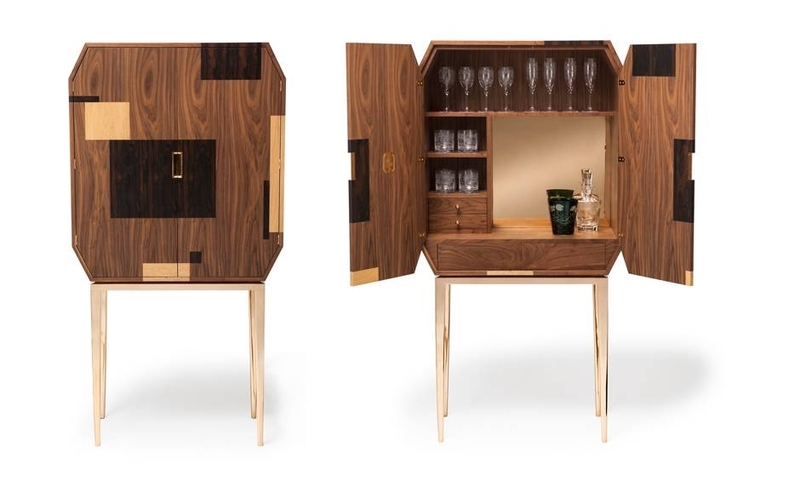 For those who appreciate inlays and fine woodwork, this drinks cabinet is for you! The intricate collage of American black walnut, zirocote and oak makes a graphic statement. The design wraps into the interior of the cabinet and adds a refined touch. High octane entertaining with a Jerry Can Bar. I often blog about upcycling interior furnishings and green building materials. As mentioned in a prior post, these gasoline totting Jerry Cans can be repurposed into nifty bar cabinets. The product is refinished in a powder coat of black or army green and spiffed up with a mirrored interior replete with shelving of walnut, oak or smoked oak. 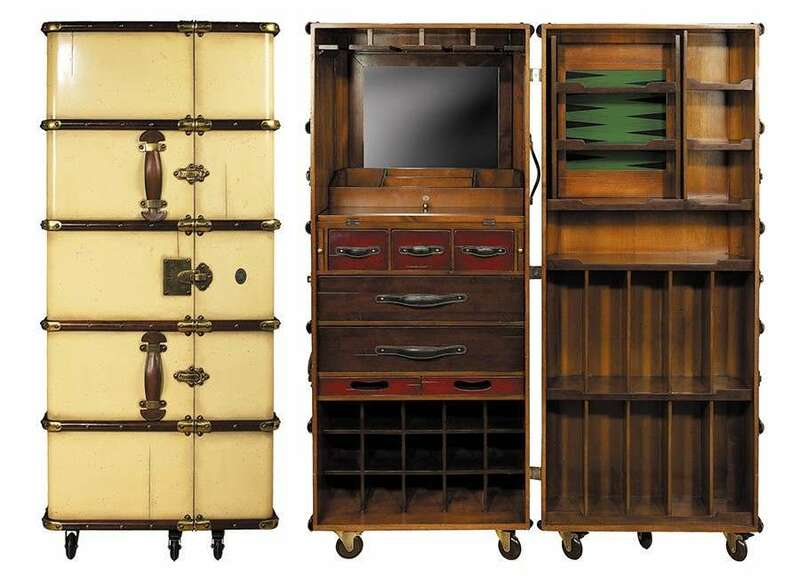 You can have a steamer trunk literally standing on its head with this ultra custom bar cabinet! If having your Sundowner out of a Jerry Can isn’t your cup of tea, this steam punk drinks cabinet by Timberwolf Bay may fit the bill. Crafted in ivory with stained leather bridle and brass fittings, this tricked-out portable bar has a foldout mixing shelf with ample storage for your Scotch and Bourbon. There’s even a reversible backgammon/chess board provided for more intellectual pursuits. How about showing off your vintage mini-bar in the round? Weighing a hefty 265 pounds from Restoration Hardware, this bar of solid iron is repurposed German light bulb testing machine. 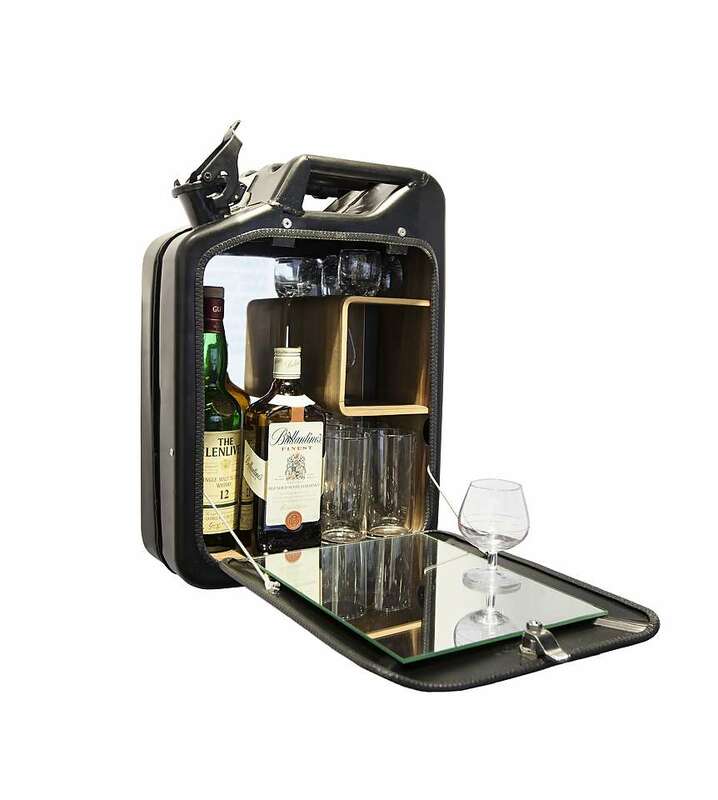 Bottles and barware are designed to so neatly stow away that will make Germans proud! The exquisite Wine Tower elevates the craft of bar cabinetry into high art. A companion piece, the Cocktail Tower, is an ode to the celebrated Manhattan. 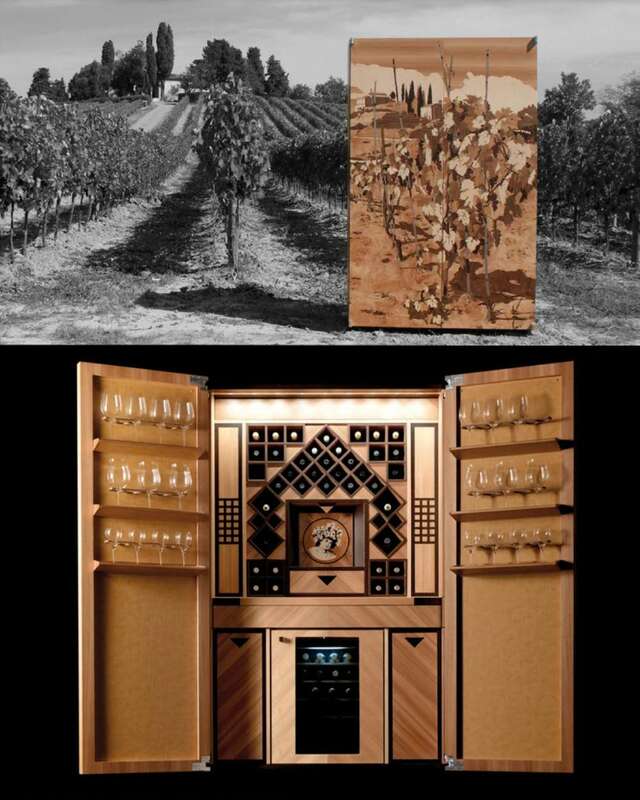 Meticulously hand made by the distinguished house of Toncelli, thousands of pieces of wood veneer in 30 finishes were used in the marquetry for the doors’ vineyard and skyscrapers. Finished in leather, the cabinets come with all necessary silver, glassware, wine tasting and bartending accessories. 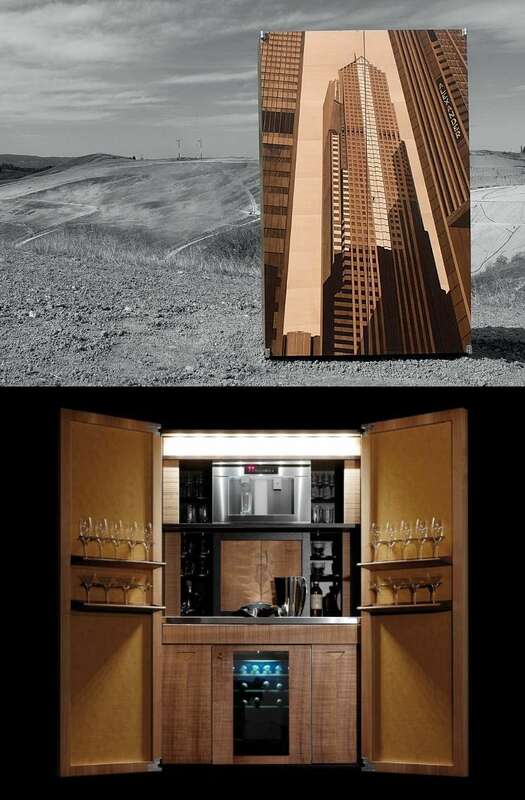 A wine cooler and coffee machine are included with the Cocktail Tower, making the masterpieces truly plug and play! May the Force awaken your inner mixologist! Created by artist Colin Johnson, this drinks cabinet is a scaled model of an All Terrain Armored Transport from the Star Wars epic, ‘The Empire Strikes Back’. The one-of-a-kind shoulder height bar is fitted out in mahogany veneer and brass trim. The center section sports a mirrored back bar with pullout shelf while glassware and accessories are stowed in the rear. 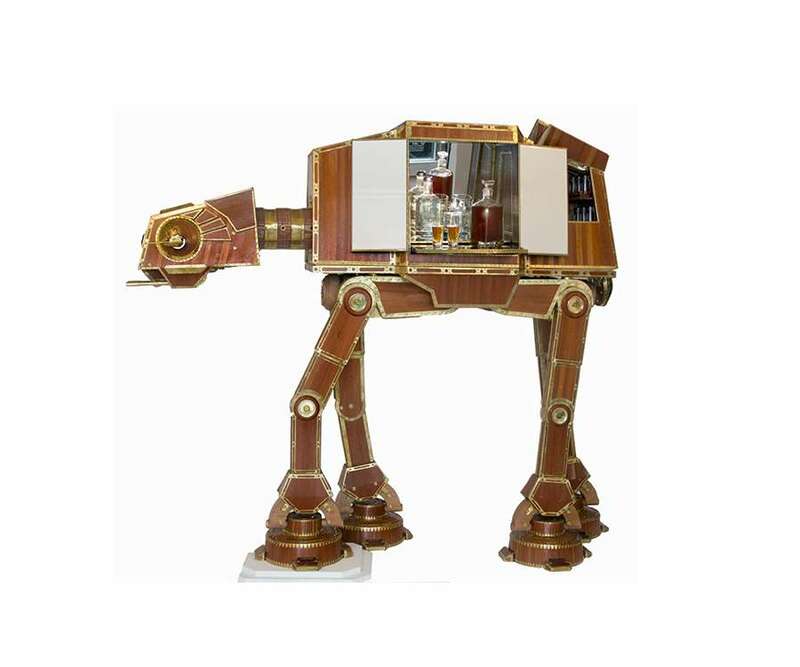 This entry was posted in Furniture, Green Design & Construction, Interior Design and tagged Bar Cabinets, Drinks Cabinets, Drinks Trolley, Interior Design, Marquetry, Recycled material, Repurpose, Star Wars, Steam Punk, Sustainable Design, Upcycle by Marie Chan. Bookmark the permalink.